The Wyoming Foreign Nonprofit Corporation Application for Certificate of Authority must be submitted to the Wyoming Secretary of State should a out of state nonprofit corporation wishes to operate as a nonprofit corporation in the State of Wyoming. This vital document will act as the centerpiece for the information and paperwork that must be presented to the Wyoming Secretary of State, so that a valid decision may be made regarding the viability of the foreign nonprofit corporation’s application. Some documents, such as the Certificate of Good Existence and Consent of Appointment by Registered Agent, are mandatory with this filing. Thus, filing entities must make sure to keep track of all the moving pieces in this application process. In this spirit, it is often suggested they foreign corporations seek legal counsel with a Wyoming attorney before proceeding with a filing or even before filling out this application. Foreign corporations seeking to do business in the State of Wyoming may submit this application by mail to Wyoming Certificate of Authority by mail. This may be done at Wyoming Secretary of State, 2020 Carey Avenue, Suite 70, Cheyenne, WY 82002-0020 or you may apply online at https://wyobiz.wy.gov/Business/Default.aspx. If you decide to submit this application by mail, it will need to be accompanied by a check, payable to the “Wyoming Secretary of State,” in the amount of $25.00 plus all applicable fees (i.e. in the event multiple filings must take place). If you are filing online, you must pay this fee by credit card. 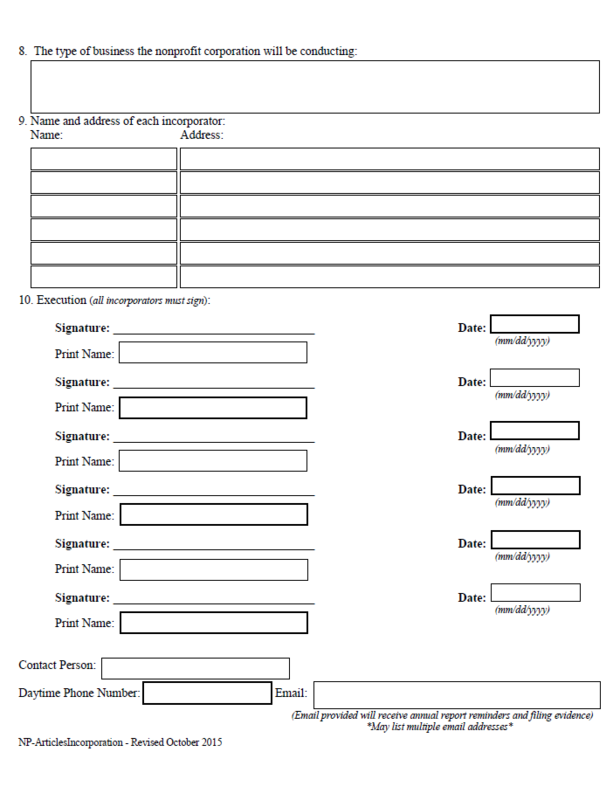 Step 1 - You will need to download this form by selecting the link above, labeled “Download Form.” Here, you must save this to your computer then fill it out onscreen using a valid PDF program or an up to date browser with the proper extensions. Step 2 - In Item 1, report the Full True Name of the foreign nonprofit corporation precisely as it appears on the Certificate of Existence/Good Standing that will be submitted with this application as proof of the foreign nonprofit corporation’s standing in its parent state. 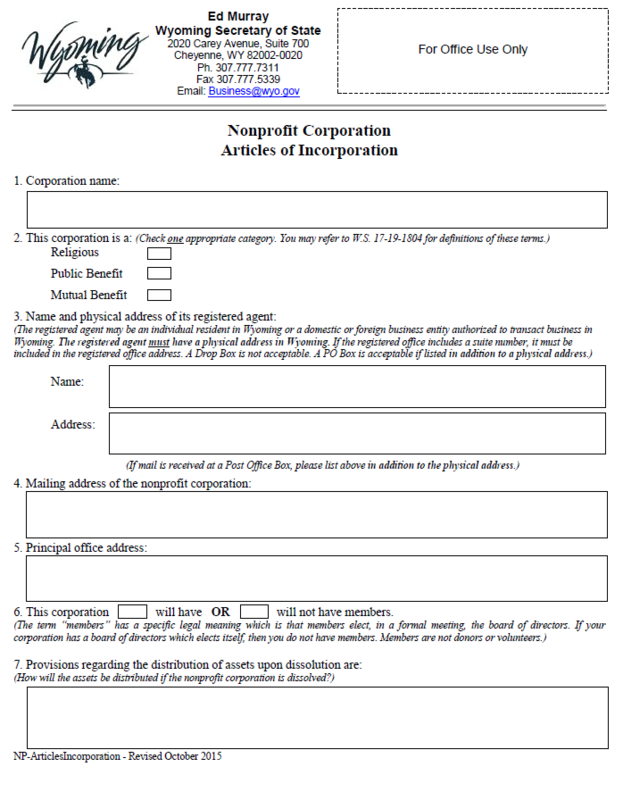 Step 3 - Next, in Item 2, it is necessary to report the proper Date of Incorporation as considered by the parent state of the corporation. Step 4 - In Item 3, report the Jurisdiction where the foreign nonprofit corporation is incorporated. If this is not another state in the United States of America but outside of the country, then report which country the foreign nonprofit corporation operates as such in. Step 5 - Item 4 will seek a definition to the intended lifespan of the foreign nonprofit corporations. Some corporations do not intend to operate indefinitely. If there is a set Date of Termination, then you must either report the Date of Termination or you must note how many years, months, and days until the Date of Termination. If this corporation has no intent on dissolving, then enter the word “Perpetually” in the box provided in Item 4. Step 6 - The foreign nonprofit corporation’s official Address must be reported in Item 5. There will be a space provided to report the Building Number, Street, Unit Number, City, State, and Zip Code of the foreign nonprofit corporations Corporate Address. If this entity has a Physical Address that is separate than the Mailing Address, report the Physical Address and the Mailing Address in this box. Step 7 - In Item 5, enter the Complete Address where the Principal Office is located. If there is a separate Mailing Address, then you must report both the Physical Address and the Mailing Address int he box provided in Item 5. Step 9 - There will be a table provided in Item 8 so that you may report the Officers/Directors serving the foreign nonprofit corporation. This will contain enough room, on appropriately labeled rows, to report the Identity and Complete Business Address of the President, Vice President, Secretary, Treasurer, and three Directors. If there are more to be reported, you must continue this Roster on a separate sheet of paper that is properly labeled. Step 10 - Locate Item 9. If this corporation has members, then mark the first check box. If this corporation does not have members then mark the second box (labeled “No”). Step 11 - Next, you must report what type of nonprofit corporation the filing entity would be considered if it had incorporated inthe State of Wyoming. If the foreign nonprofit corporation would have been considered a Public Benefit Corporation then mark the first box in Item 10. If the foreign nonprofit corporation would have been considered a Mutual Benefit Corporation then mark the second box in Item 10. If the foreign nonprofit corporation would have been considered a Religious Corporation then mark the third box in Item 10. You may only choose one. Step 12 - Item 11 will bind the foreign nonprofit corporation to the statutes listed in Article 10, Section 5 of the Wyoming Constitution. Step 14 - The final few boxes have been provided so that you may report the Identity and Information for a Contact Person the Wyoming Secretary of State may use to resolve any issues regarding this application. The Printed Name of the Contact Person must appear in the box labeled “Name.” In the box labeled, “Contact Person,” this individual must verify his/her consent to acting as such by Signing his or her Name. On the next line, report the Title the Contact Person holds (in the first box) then report the Phone Number where this individual may be reached during business hours in the box labeled “Daytime Phone Number.” Finally, enter a valid Email Address in the box labeled “Email.” It is worth noting the Email Address provided here will be used by the Wyoming Secretary of State to send notices. Step 15 - The box below the Contact Person’s section, “Required Attachment to Include with Filing” contains a check box that must be marked. This will verify that a Certificate of Existence/Good Standing will accompany this application. This is a required document. It must have been issued by the governing body of the jurisdiction where the foreign nonprofit corporation is incorporated. Make sure this Certificate has been obtained properly and submitted with this applicaton. Step 16 - Once you have obtained and organized all required documents (i.e. Consent of Appointment by Registered Agent, Certificate of Existence/Good Standing) with the Wyoming Foreign Nonprofit Corporation Application for Certificate of Authority you may submit it to the Wyoming Secretary of State. This may be done by mail and must be accompanied by a check, payable to “Wyoming Secretary of State,” in the amount of $25.00.